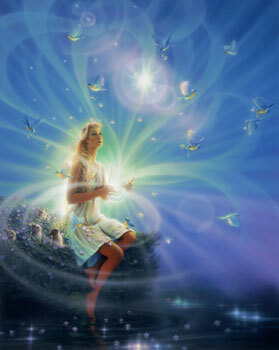 Gaia Devics and Faerie type Beings are fully engaged in this process, which is moment to moment, but process is projected for completion by the 6-6-2013. The keyword for today is cope. The energy can be overwhelming. If you find yourself feeling like you are “going down” it is because we are – down into the underworld of our shadow sides with the transit of the Black Moon. The core fear of our personal shadow sides is being triggered and this causes anxiety to the point of panic, generalized fear, utter exhaustion, and emotional volatility. So this is what we are working with while trying to ground and contain ourselves. This is also happening due to the energetic upgrade to our energetic fields (personal energetic signature or frequency) and the fact that we are moving into a different range. The “newness” often feels like anxiety. To work with this energy, first we learn about it and then we surrender to it because all transits of the Black Moon require us to surrender to the process. Resistance is futile and, in fact, it makes things worse. We practice acceptance by releasing the need to be in control and are grateful that we are being brought to a new “place” energetically. Remeber that the ultimate outcome of this transit is rebirth/regeneration. We end the transit on May 7. Until then, take deep breaths and rest as much as possible. We are all about balance lately. This is because the Divine feminine and masculine are integrating and balancing within us all. We are being guided to bring balance into everything in our lives, on all levels of our Being. Spirit recently showed me how to shift the energy and bring more balance into our relationships, and it was a huge awareness to come into! In the New, things are no longer either black or white, or contain labels such as friends, enemies, lovers, co-workers, acquaintances, etc. This is of the old. Spirit showed me that the New is all about many different levels of color. It is therefore really important to not label our relations and relationships. Because one thing is definitely true here. As we shift, our relationships with others will continue to shift. When we label our relationships, we limit them, as we limit ourselves to experience everything. When we say: I AM experiencing only this or that, we cannot experience the reality of what actually is. And what a waste that is! Do You notice yourself every time You say “no” when Love comes to You? If You continue saying “no” to Love, You can not experience it flow through You! The Healing Properties Of Music And Art. Mini-Reading For April 29, 2013. By, Bella Capozzi. Author dreamweaver333Posted on April 29, 2013 Leave a comment on The Healing Properties Of Music And Art. Mini-Reading For April 29, 2013. By, Bella Capozzi.